Quick playing patty-cake and march your buns down to the nearest fast-food joint for today’s quintessentially American food holiday. September 18 is National Cheeseburger Day! Or, grill ’em yourself. Either way, it’s hard to go wrong with a food that is so closely associated with the U.S. of A., though in reality hamburgers have been around for hundreds and hundreds of years. Way back in the 11th century, Mongols carried flat patties of meat with them on long horseback trips. The Mongols brought their meat to Moscow (how’s that for alliteration? ), and Russian sailors carried them over to Hamburg, Germany. From there they spread to New York, but the first person to actually place a meat pattie between two slices of bread is open for dispute. There are several claims for its invention; while the Library of Congress officially recognizes Louis Lassen as the inventor of the hamburger – he began selling one at his lunch wagon in New Haven, Connecticut in 1900 – Wisconsinite Charlie Nagreen allegedly tried selling fried pork meatballs at a county fair in Seymour in 1885, but when customers had difficulty carrying them around, he flattened the meat and named it after the Hamburg steaks that German immigrants were familiar with. Others who claim to have invented the hamburger include Oscar Weber Bilby, Frank and Charles Menches, Fletcher Davis, and German Otto Kuase. About the only thing agreed on is that White Castle invented hamburger buns. Things are just as murky with the cheeseburger; once again, multiple parties claim to have been the first to add cheese to the sandwich. Credit is generally given to Lionel Sternberger, a fry cook at his father’s restaurant in Pasadena, California in 1926. He is said to have added a slice of American cheese to a sizzling hamburger patty just to see what would happen. I’ll tell you what happened: delicousness happened! The cheeseburger has been a mainstay of American casual dining ever since. To celebrate, Tara and I stopped by our favorite local fast-food burger emporium, Burgerville, to take advantage of their special. 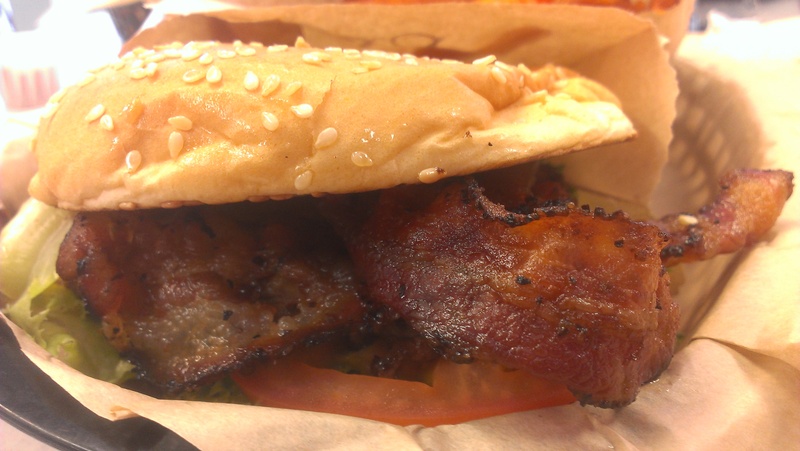 Burgerville is recognizing the food holiday by offering a free Pepper Bacon Cheeseburger with the purchase of another one. Throughout this year’s challenges, very few businesses have capitalized on the associated food holiday, which has surprised me. I suppose they’re simply unaware of them? I’d think advertising that it’s a certain food holiday when that item is on your menu would be a great marketing ploy and could be worth a little extra business, at least. Can’t see the cheese because of the bacon, but it’s in there, folks! I hope so. It’d be in their own best interest if they did! Thrilled that you went to my favorite burger joint. Anne had those burgers on our way down and on our way home. Kudos to whomever invented the cheeseburger. Why would anyone want their burger plain? Unless, of course, you are lactose intolerant. And in that case, too bad, so sad. I agree. I don’t think I’ve ever had just a plain hamburger in my life.